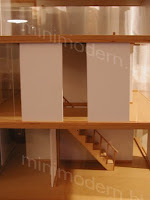 Well, I finally got around to painting and building the 360 Dollhouse. 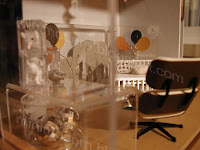 I think I am going to get new Plexi panels for it. There are some typical wear and tear scratches on the current panels, but it's hard to live with if you weren't the one who did the damage. 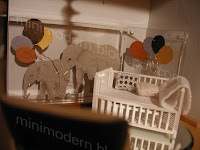 I decorated one room--a test modern nursery design. I emailed you earlier. I didn't want to put my email up for all to see. Anyway, I LOVE this room. Did you make the elephant mural? 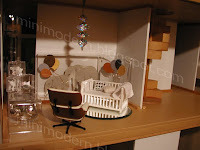 When you say "test", do you mean that you are going to make this nursery in actual real size? Yes, I did make the mural. When I said "test", I meant that I'm not sure if I'm keeping the room that way. I expect to decorate the whole house in the next few days and was trying out something temporarily to see how it looked. I'm glad you like it. 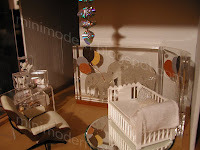 Is that the crib from one of the re-ment sets? If so, how do you find the scale of that for 1:12? Tks. 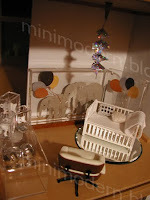 Yes, that is the crib from the Re-Ment sets. It is the standard version. It's one of those Re-Ment pieces that fits well in 1:12 scale.